Using lagniappe in your catering business is just one more step to make you stand out from the competition. This past May I held a full day catering seminar and tour of Cantina Mamma Lucia in Baltimore. Frank, the owner and longtime client/friend, was generous enough to offer a tour and talk at his facility. What impressed me most was this Italian’s use of lagniappe. For every catering order he throws in a table cloth, mints and ice bowl when drinks are ordered. In the grand scheme of things, I am guessing these nice little touches maybe cost Frank three to four bucks. In the mind of his catering clients, they add way more value and contribute to Frank’s high level of repeat corporate catering. At Corky’s we always threw in disposable serving utensils and a squeeze bottle of barbecue sauce. I guess the cousin of lagniappe is offering a higher value. A few weeks ago I was doing a catering menu engineering session with Mike with Frato’s Pizza. 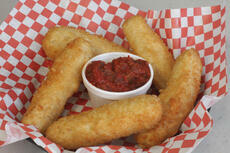 Instead of breadsticks, he gives away handmade mozzarella cheese sticks. I was a little shocked, but found out they cost him little to make. This bit of higher value keeps people coming back to him. During the Labor Day weekend, I threw a dinner party for some of my friends. My girlfriend, the Queen of Pinterest, came up with a really neat idea to dress the buffet and let everyone know what was being served. She bought chalkboard wrapping paper and lined my island. 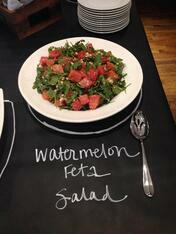 She then outlined each serving dish with a chalk marker and wrote the name of each dish next to it. She received a ton of compliments. You could easily creatively copy this idea. Buy vinyl tablecloths in bulk. Create cardboard cutout templates of your pans, bowls, wire chaffers, etc. When the driver drops off the food, have him draw outlines of each catering component on the vinyl cloth. Test out a paint marker and a chalk marker. Then place each food pan/item in the appropriate outline. Then write the name of each item underneath the outline. 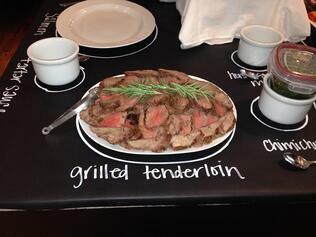 Your catering clients will appreciate the table cloth and nice extra touch. From mints to table cloths to throwing in anything of added value or surprise, we all can learn a lot from our Cajun cousins in the South.